In the last blog post we talked about data loss and data corruption, two problems that can (and do) happen eventually to nearly everyone who uses a computer. With ChessBase and Fritz, the best remedy for the problem is to remember to always back up your work; when problems arise, you can simply replace the corrupted database with an uncorrupted backup. The next-best solution is to take corrective measures after the fact. Many times the problem is correctable, although you can’t always bank on this being the case. You’ll occasionally encounter a problem which initially looks like a corrupted database, but which really isn’t; for example,you might do a search which comes up with odd or incomplete results. In one case from my personal experience I was performing a search for a specific opening setup and was seeing many games in which the colors were reversed. But when I checked the database’s game list I wasn’t finding dozens of “Data error” entries (which would indicate a corrupted database). What, then, could be the problem? 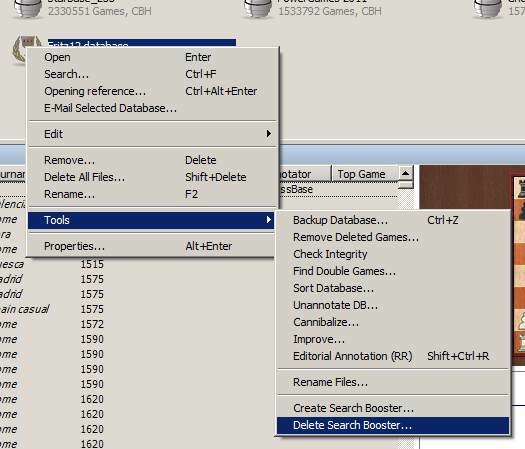 You’ll recall from the previous article that a ChessBase-format database is made up of multiple files. 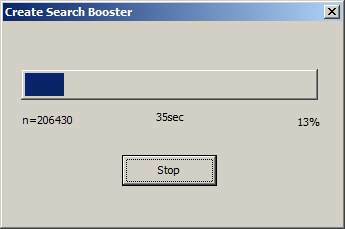 Once of these is called the search booster file, a special file which is designed to greatly speed up the software’s search functions. Each time you search a particular database the search parameters and the search results are recorded in the search booster file; the next time you perform that same search on that particular database, the software will pull up a game list based on that pre-recorded information. This makes the second (and subsequent) searches far faster than the initial search. An occasional problem arises due to the magnetic nature of a computer’s digital storage medium; basically, the more a program revises the contents of a particular file, the greater the chances that the data may become scrambled. This is admittedly a minor concern; this sort of thing doesn’t happen all that often. But if your database searches begin to show odd results (like my “color reversal” problem), a “scrambled” search booster file is a very likely culprit. 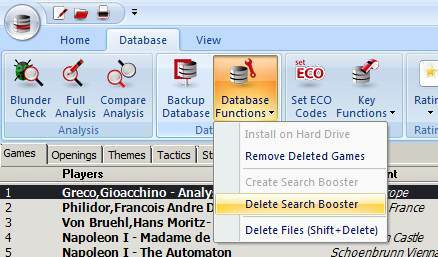 This particular dark cloud has a bright silver lining, in that the search booster file isn’t a crucial database file: you can completely delete a search booster file without rendering the database useless, and the only thing you’ll lose is that stored information regarding prior search results. Click the “OK” button and the deed is done. …after which you’ll see the results of your search. Aside from this initial step, everything else occurs as described above for Fritz. Note that the command appears in half-tone in Fritz (as seen above) and is thus unavailable unless the database in question doesn’t presently have a search booster file. As you can see, search errors caused by a scrambled search booster file are quite easy to fix – just delete the search booster and create a new one. But sometimes the database errors are far more serious. You still have a shot at correcting them and saving your database (or at least part of it); we’ll look at these errors (and their “fix”) in our next blog post.